The “Client of the Month Award” is an award given to a client who goes above and beyond what is expected of them. Client of the month award is for someone who truly gives their all day in and day and leaves no stone unturned in their journey! These individuals who earn this accolade live the “ABFitness” lifestyle. Hardwork, dedication and determine make up this lifestyle. The winner of the Client of the Month award will receive a special gift from me and the honor of being showcased on the gym wall! The winner will be chosen on the 1st of every month. 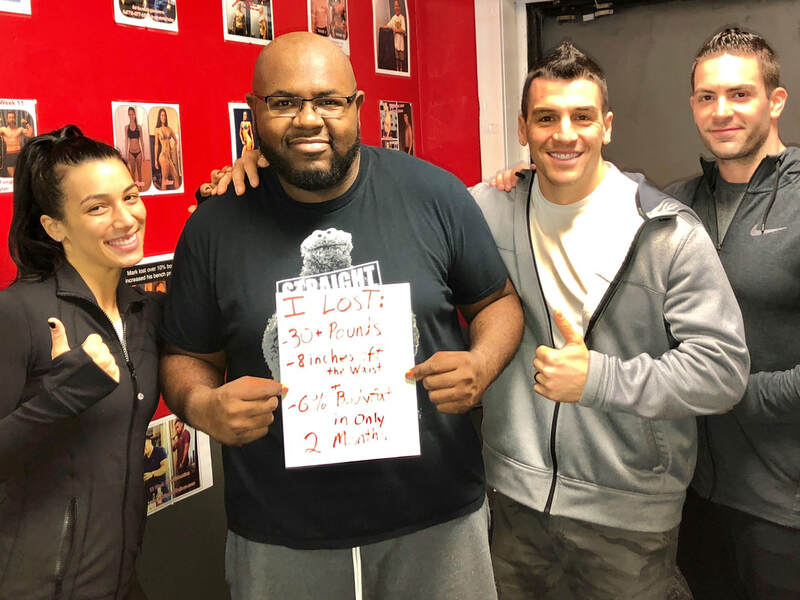 Our March Madness 30 Day Fat Loss Challenge was a huge success!!! We had a close competition but congratulations to all of our clients that entered...one of the cool things were most of them had a big jumpstart and actually have lost more post contest! But without further Ado here are our winners! He won an upgrade to his membership! "I just want my before baby body back". Those were the words Gabriella told me during our initial assessment. Gabriella felt like most moms due after they have their second baby. Frustrated and stuck. Her old body seemed so far away and she was at a plateau. "I dont understand I am eating so healthy but have not lost a single pound". If you are a struggling mom getting no where in the battle to get your old you back...Give us a call! At 54 years old he didn't think it was possible. I remember sitting down with him the first time explaining to him that he didn't have to live in the gym to get results. My exact words to him "Twice a week for 30 minutes is all you need to get insane results and have time for other important things in your life". Boy O boy was I right! For January our client of the month is Clara E.
Client of the month however is not just about inches and lbs lost. It’s about dedication and commitment. Progress in the gym is just a byproduct of that. Clara’s dedication is second to none and we couldn’t be more proud of her commitment and effort put in every day. From being at the gym every morning at 6am to following her nutrition plan the other 23 hours of her day. She puts in the work and makes no excuses! That’s why she’s our client of the month! Give Clara’s story a listen and find out how she reaches her goals! For the month of December the Client of the month at AB Fitness Center is Mike D! Mike has a demanding schedule as a police officer but has made fitness a priority in his life! Mike has lost well over 20lbs of pure fat while losing 8 inches off his waist and 7% bodyfat in only 2 months! He did this by following the nutritional plan we customized for him along with training only 1x per week for 30 minutes with us! That's right only 1 per week! I always explain to people more is not always better! Its all about quality over quantity and Mike understands that now! We are very proud of Mike for what he has accomplished in such a short time. Give Mikes story a listen!! The client of the month for November is Duddley Francois !!! Duddley has been working out with us for less then 2 months and has dropped well over 30lbs, 6% bodyfat and lost 8 inches off his waist. In addition to fat loss Duddley has added well over 75lbs to his squat and 100lbs to his deadlift. Duddley has only been training with us 1x per week for only 30 minutes! Thats right no long drawn out workouts just ONCE per week! Duddley follows the meal plan 100% and the results speak for themselves. Everybody falls into the trap of thinking that more workouts equal more results. Duddley is proof of that! Duddley focused on only the important things that matter, he didn't stress over the latest diet trend or workout program. He hired us executed on his plan and got results. Imagine what this guy will look like in another 2 months! Great job Duddley thank you for inspiring us all! We are all very proud of you! Gayle has done phenomenal! Her results speak for themselves! She’s down 10lbs and has lost about 4% bodyfat in a few short weeks! Fat loss aside she has truly made Fitness a lifestyle. She is much more conscious of her food choices. The challenges she faced was due to her career. Gayle is a teacher and being a teacher can be very stressful. She used to turn to food for comfort! That is no longer the case! Gayle has learned how to eat better and be more conscious of her eating. I am beyond proud of her results and how far she has come! She has transformed both physically and mentally! What I am most proud of is the change in her relationship with food. Nutrition is no longer something that she looks at as a quick fix but a lifestyle change that she fully understands and has control of for the rest of her life! Give her story a listen! 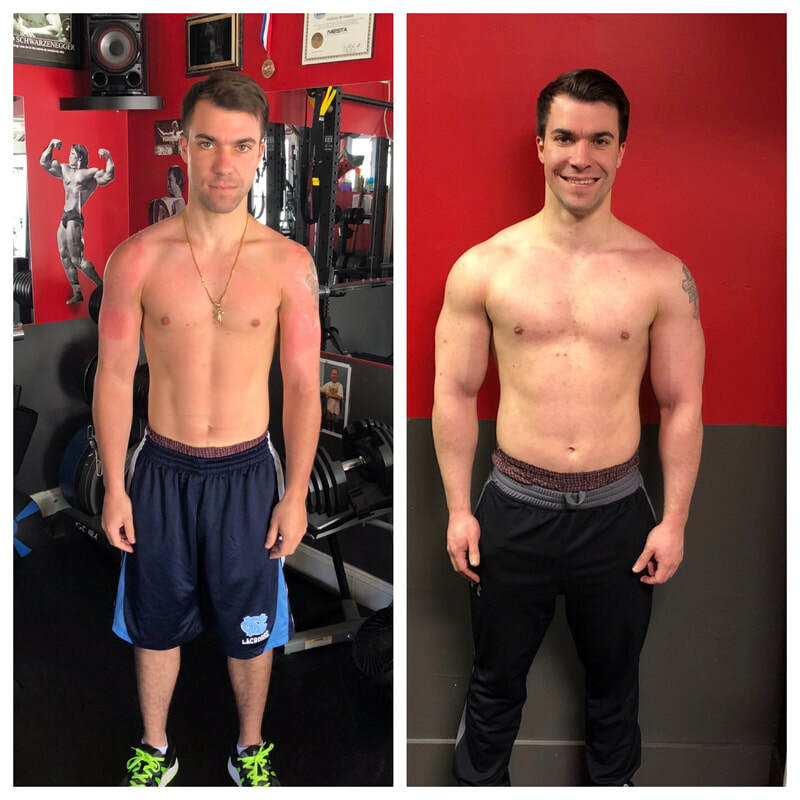 John managed to put on 10lbs of pure muscle in 6-7 weeks! In addition he has added almost 80lbs to all his lifts! I am beyond excited for Florence! Florence has lost over 10% bodyfat. Florence is one of the most diligent clients I have ever seen! She keeps detailed nutritional logs that are even color coordinated! When Florence came to me she was suffering from really bad shoulder issues. Her left arm was basically useless. Today she has full use of her arm! Florence has done all of this with working full time, being a mother of 3 and (not that it matters) being over the age of 50! Florence has done a phenomenal job of making Fitness part of her life and this is why she has experienced so much success! Congratulations Florence you truly have earned it!!! I am so proud of her accomplishments! In about 8 weeks of seeing me only 2x per week she managed to lose 9% bodyfat and well over 20lbs!! I am beyond proud of how much work she puts in with her nutrition! She is very diligent with her eating and it’s clear by her results! Congratulations Kim Enjoy your $50 gift card!! If you are interested in becoming your own success story click the link below and let’s get started!!! Karen has won for the month of June...Karen has Lost 25lbs and 9% Bodyfat in such a short time. Karen had cancer and after chemo treatments found herself very weak. ​In addition to that she was had high cholesterol and was pre-diabetic. She struggled to do everyday tasks. Karen found me on google and decided to give training a shot. Karen is now stronger then ever at 60 years old! This month I have decided to show case 2 clients. These two gentlemen are the definition of hardwork and perseverance. In my eyes they are well on their way to achieve more then an ideal body. They have embodied the ABFitness Way in and out of the gym. My special gift for them was a trip to Metlife stadium for a Fan Fest. We were able to walk the field, lockroom tours and watch the 2018 NFL Draft from the field! Phil Risorto lost over 30lbs, added well over 50lbs to all his lifts while overcoming multiple knee and shoulder surgeries. Phil tracks everything from his daily calories, steps and daily weight. Never have I seen someone so dedicated to achieving a goal. Steven Post dropped over 10lbs and 3% bodyfat in less then 2 months. In addition he added almost 60lbs to his deadlift, 50lbs to his squat and 30lbs to his bench. Steven also manages to be diligent with his diet while being a great dad and husband.